Fancy a spontaneous short holiday in May that leaves nothing to be desired? Then don't miss this offer and book now unforgettable holidays at the Landhaus Hotel Kristall in Marling, your holiday home in South Tyrol. If you book 4 nights or more, you will receive a 5% discount on the room price. What are you waiting for? Secure your very own personal May experience now! 5% discount on the room price! Weekly theme buffets with selected fish specialities, a large selection of desserts and cakes as well as a 6-course gala dinner on Sunday. Offer valid according to availability. We ask for your understanding that bookings already made are excluded from the offers and cannot be cumulated or combined with each other. 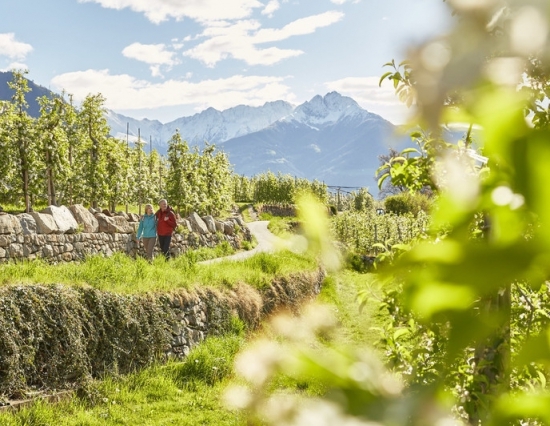 If possible, we obtain the products from our own organic nursery (pears, plums, kiwi, nectarines, strawberries, raspberries, blackberries, currants, nuts and much more), the hotel's own herb garden and from our apple meadow.